This post is inspired by the article "Ex-Valve employee describes ruthless internal politics at 'self-organizing' companies" in PC-Gamer, which in turn was triggered by a stream of tweets by Rich Geldreich. 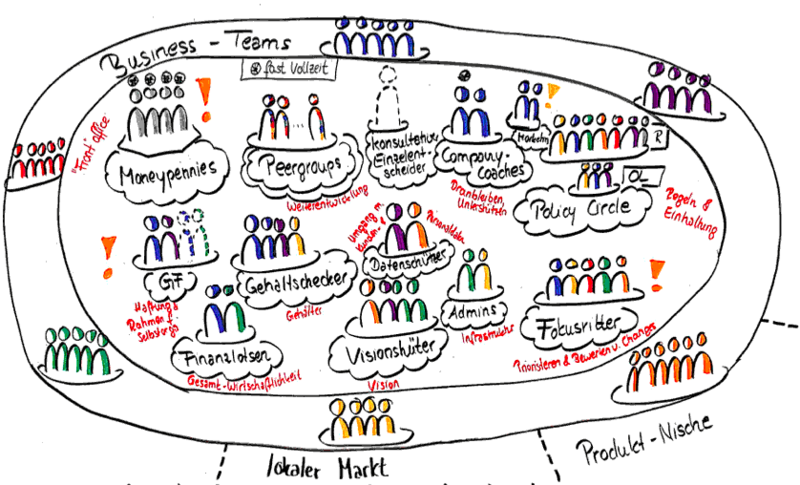 I am writing this to share my experience from working at it-agile GmbH. It is not my intention to prove Rich wrong (I am not questioning his experience), but to provide an alternative view on what working at a company with a non-tranditional structure can be like - and what might be necessary to make it work. Disclaimer: this is purely my personal perspective and opinion. Nobody at it-agile (or elsewhere) approved of this text. I am writing this during my vacation, out of passion for this way of working. A bit of background: it-agile was founded in 2005 by three colleagues who where unhappy about how they were treated by their boss. Today (July 2018) we are 42 permanent employees, currently growing quickly. About 65 percent of the company is collectively owned by all permanent employees. I joined it-agile in 2009 and went through a couple of phases since then: excitement, puzzlement, frustration (for halve a year, I seriously considered quitting). Today, I would describe my relationship to my company of choice as mainly dominated by appreciation - for the joys and difficulties of working in such a structure, for being able to be part of such a "social experiment", and for my colleagues, who, despite all our differences, are willing to invest into our shared journey. In all those years, we learned a lot about how to run a "boss-less" company - and we are still learning. And that's definitely not always fun. For the rest of this article, I will pick a couple of Rich's tweets that I feel I can provide an interesting alternative or complementary perspective on. I will skip those that are specific to working in a software development team. So-called “self organizing” companies are controlled by mass anxiety. Anxiety is contagious. I don’t think they are healthy places to work. I can see at least two reasons why that would often be the case. First, if you take away formal hierarchy, it will quickly be replaced by an informal hierarchy. There will always be people who have more influence than others. The company culture will quickly reflect the values in action of those top influencers. And even if they espouse values of cooperation etc., they will have learned tools of coercion that they fall back to when things get rough. They just don't know any alternatives. A central hurdle is that the tools of coercion actually had an important function: creating "alignment". If you take that tool away without replacing it by alternative structures that fulfill that function, it's very easy to loose cohesion over time - at some point, it might easily feel like anarchy has broken out. The only working alternative that I am aware of is social pressure, created by "brutal transparency" and shared responsibility. At it-agile, every co-worker can see how I spend company money, and every cent I spent affects the profit share of everyone else. If I do something that seems irresponsible, I will get strong feedback, sometimes in a way that is hard to digest. So, in summary, if you think you get a "self organizing" company by just taking away or reducing the formal hierarchy, I am not at all surprised if you end up with increased anxiety. If you’re dealing with a self-organizing company it’s more complex. You will be triangulated against multiple people and you’ll have to deal with group consensus. True. Navigating (and shaping) the social network becomes a much more important skill when you take away the hierarchy. Personally, I would rather learn this one, than learning how to game the formal hierarchy. Also, you can put structures and agreements in place to deal with the negative effects of triangulation (aka office politics). At it-agile, we have developed a shared understanding that if we talk about a coworker, we hold each other responsible for then also talking with said coworker about the topic that bothers us. What you’ll find is that the corporate arm influences, controls, and “anxiety spikes” the self-organizing arm nearly constantly. It’s not self-organizing, it’s a company with opaque managers ruled through mass anxiety and fear. As Niels Pfläging argues much better than I could, flatter hierarchies are not the answer, decentralization is. And it comes with the challenges mentioned above. A lot of Rich's tweets reference the existence of such a "corporate arm". His advice seems to revolve around how to use that fact for your advantage, or at least survive it. If I'd ever decided to work for such a company, only if I'd see a chance that that "arm" actually would be interested in getting reflected their (negative) impact and change their behavior. There are whole books written about why (individual) bonuses are a really bad idea in today's workplace. That is true doubly so for "self-organizing" companies. Having said that, a fair compensation structure is a very complex problem to solve, that we haven't fully figured out yet ourselves. I am not even sure that it's possible. We are experimenting with variations of different approaches for years now, and are in constant dialog about it. That's the most important thing for me: I can talk about what bothers me, and I have an impact by doing so. I also understand that what would work best for me, wouldn't work well for everyone of my colleagues. On a competitive team within a self-organizing company, avoid asking for help unless you absolutely, positively need it. Any information you receive may be purposely distorted in some way. If you do ask for help, gather consensus from multiple devs. Putting teams inside the company in competition to each other - another stupid idea that becomes even worse in a self-organizing company. What you do want, is teams holding each other accountable. A team at it-agile that seems to struggle will get asked "what are you doing to get out of the struggle", but also "what help do you need". A team that does exceptionally well will get asked how they do it - both to learn from it, but also to make sure they don't overwork themselves and steer into burn-out. If you’re running a self-organizing company, you need to have a measure and understanding of the current average and peak Anxiety Level within the self-organizing arm. Or it blows up and talent walks. This is an interesting tweet. I would rather say "if you're running a self-organizing company, what the heck do you mean by self-organizing?" A self-organizing company, by my definition, isn't run by a single person (or small group of people). Having said that, it's true that it pays to have someone who has an eye on the company atmosphere (which is much more than just anxiety level). In 2016, we introduced the role of a company coach for that (though not just that) purpose. It's a rotating role, that one colleague fills full-time, assisted half-time by another colleague. Remember: these are colleagues who would otherwise be out there making money for our shared profit. And we all decided together that it's worth it. These folks will be given a free pass. The corporate arm can hire and fire anyone they want at any time. If you went through the normal interview loop and weren’t filled in beforehand, the corporate arm could care less about you. After skipping a couple of "corporate arm" tweets, this one stood out for me. At it-agile, an interview is done by at least four self-selected colleagues. If I have a strong doubt about a hire, I can be part of the interview. And all those colleagues in the interview need to agree to make an offer. So ironically, the better and more skilled the recruit the less probable it is that they’ll get the job. Current employees don’t want any more competition for their bonuses. Interestingly, shared profit has the exact opposite effect: the better the recruit, the more profit he will produce, the bigger my profit share. If you run a self-organized firm and you have turned up the anxiety levels too high, your company will become brittle and prone to mass talent flight. Wealthy competitors can come in and make offers and basically steal all your tech and devs right out from under you. I would emphasize that that can happen to you simply because you don't know how to run a self-organized company. At it-agile, at one point the level of frustration became so high, that we feared if we'd just continue, we all would quit in a matter of two years. And nobody wanted that level of frustration or was willingly benefitting from it. OK, I could write much more, but I am getting tired, and this is already quite longish for a blog post. If you are interested in something specific, I will happily answer your comment. Or, if you read German, you can look at the book that I am very slowly writing on LeanPub: "Wir arbeiten hier trotzdem". Ich habe in den letzten Wochen darüber nachgedacht, wie Agilität Effizienz fördert und sammle meine Gedanken in einem Artikel, den ich in einer der nächsten Ausgaben der agile review veröffentlichen möchte. Ich veröffentliche den gegenwärtigen Stand hier vorab, weil ich hoffe, dass er bereits "gut genug" ist, um euch nützlich zu sein – und weil ich hoffe, durch euer Feedback die weitere Arbeit effizienter zu gestalten. In den letzten Wochen bin ich umgezogen und renoviere jetzt die alte Wohnung. Viele Teilaufgaben führen mich durch Abende voll Beschaffung,Transport und Handwerk. Immer wieder frage ich mich abends: Hat sich das gelohnt? Habe ich effizient gearbeitet? Daraus wuchs die Frage, was Agilität und Effizienz miteinander verbindet. In der Wikipedia heißt es, Effizienz sei der rationale Umgang mit knappen Ressourcen; der Ausdruck eines guten Verhältnisses von Kosten zu Nutzen. Effizienz bewertet also, ob wir die Dinge richtig tun. Der Wunsch nach Effizienz ist der Hintergedanke der Spezialisierung in Taylors Theorie des Scientific Management und damit die Grundlage vieler Organisationsstrukturen und Vorgehensmodelle. Auf diesem Gedanken fußen auch agile Methoden, die ihren Fokus stets zuerst auf Effektivität richten. In meiner Arbeit als Unternehmensberater begegne ich immer wieder Managern und Teams, die diesen Fokus kritisieren und einen Mangel an Effizienz beklagen. Dabei handelt es sich um ein Missverständnis: Effektivität geht vor, aber sobald wir das Richtige tun, ist Effizienz von größter Bedeutung. Deswegen fordern agile Methoden mehr, als nur die Arbeit zu priorisieren: Agile Methoden erfordern Disziplin und ein unablässiges Streben nach Exzellenz – in der Zusammenarbeit, in der Technik und in der Struktur Ihrer Organisation. Diziplin bedeutet für den Einzelnen und für das Team, den Verlockungen einfacherer, angenehmerer Aufgaben zu widerstehen und das Ziel für das Produkt und das Unternehmen im Auge zu behalten. Für die Zusammenarbeit und die Wahl der Aufgaben heißt das, dass Vorlieben zurückstehen hinter Wertschöpfung für den Kunden. In der Technik äußert sich Disziplin in der Qualität des Ergebnisses, auch wenn der Weg zu einer zufriedenstellenden Lösung nicht offensichtlich ist. In der Organisation zeigt sich Disziplin in der schonungslosen Ausrichtung an Kunden und Markt, die Nabelschau und Machtspiele verhindert. Effizienz ist immer Effizienz der Handlung. Was wäre also effizienter, als nicht zu handeln und dadurch schon Nutzen zu schaffen? Handlungsleitend kann dabei Paretos 80/20-Regel sein. Zur Erinnerung: 20% des Aufwands liefern 80% der Ergebnisse und 80% der Kunden sind mit 20% der Ergebnisse bereits zufrieden – solange das Richtige priorisiert wird. Mit überraschend wenig Aufwand könnten wir also bereits ein gutes Ergebnis erreichen mit einem hervorragenden Verhältnis von Kosten und Nutzen – und genau das ist Effizienz. Ich nenne dies das „Gut-Genug-Prinzip”: Gut genug ist gut genug. Das bedeutet: Sobald „gut genug” erreicht wurde, sollten Kosten und Nutzen für jeden weiteren Schritt genau gegeneinander abgewogen werden. Möglicherweise können wir uns bereits jetzt etwas widmen, in dem wir mit weniger Aufwand wirksamer wären. Im Optimalfall etwas, womit wir unsere Kunden begeistern! Agile Methoden betonen zu Recht Effektivität. Sie ist die Voraussetzung für Effizienz, für ein gutes Verhältnis von Kosten und Nutzen, das bereits in Agile Methoden eingebaut ist. Es ist an uns allen, unsere Arbeit daran auszurichten – und vorher schon das Richtige zu tun. In meinem Fall also diesen Artikel im Zustand „gut genug” zu lassen (hoffentlich) und mich wieder dem Renovieren zu widmen. Was passt? Was fehlt? Ich freue mich auf eure Kommentare. 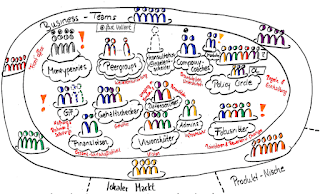 Wir bei it-agile in München sind ein recht chaotischer Haufen. Wir lieben unsere Freiheit, sind alle sehr unterschiedlich und haben es uns zur Aufgabe gemacht, zu einem erfolgreichen Team heranzuwachsen. Der klassische Weg klingt verlockend: Wir schauen auf die Auslastung der Kollegen und ziehen uns genau die Anfragen, die uns eine stetige Auslastung bringen. Damit sorgen wir dafür, dass wir die in unserer Branche übliche 80%-tige Auslastung erreichen. Das ist zumindest das Ziel, das ich von meinen vorherigen Firmen kenne. Doch die Natur unseres Geschäfts macht uns dabei viel zu schaffen: Länger als zwei Monate im Voraus kann keiner von uns planen. Kunden haben Unterstützungsbedarf unabhängig von unserer Planung. Meist sehr kurzfristig. Hinzu kommt, dass wir unsere Kunden nicht dauerhaft von uns abhängig machen wollen, sondern sie möglichst schnell in einen Zustand bringen wollen, in dem sie uns nicht mehr brauchen. Das widerspricht natürlich dem oben genannten Ziel. Hinzu kommt, dass wir den Kollegen Wahlmöglichkeiten für die Auswahl von Jobs bieten wollen. Nicht jeder Job den wir machen könnten, sollten wir auch machen. Neben genügend Geld verdienen steht das Interesse der Kollegen, herausfordernde und spannende Jobs zu machen. Schließlich ist die Zufriedenheit der Mitarbeiter mindestens genauso wichtig wie die der Kunden. Wir brauchen also einen anderen Ansatz. Wenn wir uns unser Problem anschauen, ein Umsatzziel in einer nicht-planbaren Umgebung zu erreichen, stellt sich schnell raus, dass es ein Limitierungsproblem ist. Kurzes googeln zeigt, dass ein Jahr 250 Arbeitstage hat (zumindest in Bayern ). Die Ausgangsfrage lässt sich also darauf reduzieren, dass jeder Kollege an jedem Tag entscheiden kann, welche Art von Arbeit er macht: Arbeitet er für einen Kunden, bildet er sich weiter, arbeitet er intern oder macht er Urlaub. Für jeden Tag im Jahr muss diese Entscheidung getroffen werden. Klingt wie gemacht für Kanban-Karten: jeder Tag ist ein Signal, dass dort eine bestimmte Arbeit verrichtet werden kann. Nichts leichter als das: wir besorgen 250 verschiedenfarbige Lego-Steine für jeden Kollegen und teilen diese in fünf Kategorien: 140 für Kundenarbeit (orange), 20 für Weiterbildung (blau), 30 für Orga (gelb) und 30 für Urlaub (weiß). Dann bleiben noch 30 für Slack (grün), also ungeplante Zeit übrig. Damit ist die gesamte verfügbare Arbeitszeit eines Jahres abgebildet und wir schauen uns regelmäßig an, wie viele Steine jeder Kollege verbraucht hat. Wir betrachten unser System retrospektiv und können für jeden Augenblick sagen, wie wir gerade dastehen: wir kennen die durchschnittliche Erwartung an ausgegebenen Steinen und die tatsächlich erzielte Anzahl. Damit haben wir ein Bild, ob wir gerade über oder unter der statistischen Erwartung sind. Natürlich reicht das noch nicht. Rein statistisch steht jedem Mitarbeiter pro Monat 2,5 Tage Urlaub zu. Die Realität zeigt jedoch, dass Kollegen den Urlaub nicht gleichverteilt nehmen, sondern sich diesen zum Beispiel für einen ausgedehnten Sommerurlaub aufsparen. Die Konsequenz davon sollte sein, dass wir in nicht-Urlaubszeiten mehr orange, also Kundentage, und weniger weiße Steine sehen, da hier der Kollege Urlaub anspart. Um das abzubilden, ist es naheliegend, das gesamte Jahr als Kalender nachzubauen und darauf alle Steine zu verteilen. Damit haben wir ein für das Jahr abgeschlossenes System und können die Auswirkungen der tatsächlich erzielten Arbeitsverteilung auf die Zukunft direkt erkennen. Das heißt ich deale mit mir selbst. Macht ein Kollege mehr Kundentage als im Durchschnitt, wird sofort sichtbar, dass er in der Zukunft mehr Urlaub, Slack oder Weiterbildung machen muss. Und umgekehrt. Was ist aber, wenn jemand mehr Urlaub haben möchte oder mal eine größere Weiterbildung machen will? Hier beginnt das Teamdealen. Wenn ich mehr weiße Steine haben will, muss ich die von einem Teammitglied „abkaufen“ indem ich orange Steine eintausche. Wir sind noch mitten in der Erfahrungssammlung mit unserem neuen System. Bisher können wir sagen: die Lego-Steine geben uns die individuelle Freiheit bei gleichzeitiger Betrachtung des Team-Ergebnisses. Mit unseren jeweiligen 250 Steinen kann jeder planen, so wie es ihm damit am besten geht. Und wir sehen auf unserem gemeinsamen Kalender sofort, welche Auswirkungen unsere Entscheidungen auf das Teamergebnis hat und ob wir etwas anpassen wollen. Habt ihr Anregungen wie wir das System noch verbessern können? Dann schreibt uns. Wir freuen uns, die Ideen auszuprobieren. Eben gerade habe ich dem Webinar von Jeff Sutherland und Ken Schwaber gelauscht, in dem die aktuellen Änderungen am Scrum-Guide erläutert wurden. Viel hat sich nicht geändert, aber ein Abschnitt zu den Scrum-Werten wurde hinzugefügt, im englischen Original findet er sich hier. Wie zu erwarten sind es die folgenden fünf Werte geworden, die bereits von Ken Schwaber in seinem ersten Scrum-Buch veröffentlicht wurden. Interessanter Weise haben Ken und Jeff eine Reihenfolge gewählt, um die Werte zu erläutern, auch wenn sich diese Reihenfolge nicht im Scrum-Guide wiederfindet. Commitment: Das Commitment des Teams und des Managements sind nötig, damit Dinge wirklich angegangen werden und wirklich erledigt werden mit voller Energie. Das Team versucht nicht nur das Sprintziel zu erreichen, es ist darauf committet! Fokus: Erfolgreich kann man nur sein, wenn man sich auf seine Aufgabe fokussiert (und auch ein Commitment ohne Fokus ist vermutlich nichts wert). Offenheit: Gerade für Wissensarbeit gilt, dass Offenheit mehr Optionen schafft und eine größere Chance darauf bietet, dass man gemeinsam eine bessere Lösung findet. Es sollten auch alle wissen, was gerade das größte Problem ist, damit jeder zur Lösung beitragen kann. Respekt: In gewisser Weise ist Respekt eine Voraussetzung für Offenheit. Denn nur, wer sich respektiert fühlt, wird auch offen zu seinen Schwächen stehen können. Mut: Offenheit, Veränderung und das Ansprechen von Problemen benötigt Mut. Zudem benötigt auch der Einsatz von Scrum Mut, weil man die vielen Vorteile von Scrum nicht ohne den Nachteil großer kultureller Veränderungen in der Organisation bekommt. Review of "Functional Principles for Object-Oriented Development"
After a long time of agility and philosophy, here's something technical for a change. Yesterday, I was talking OO and functional programming with Alex Chythlook, who told me that some problems I faced in Anathema could have been solved much easier applying functional programming idioms. When I asked for details, he pointed me to a talk Jessica Kerr (@jessitron) held at GOTO 2014. Go here in case you're watching the talk and would like to actually see the slides. All of her points are well made, and she's an entertaining presenter. I am happy that she pointed out some things that I didn't have names for previously. However, I am surprised that many of these ideas are functional, as they just appear to be thorough applications of OO principles to me. If they have been functional all the time, then it is certainly good to call them thus. "Errors are data too" Jessica said and told us to "not interrupt the execution flow". I've long spoken out against checked exceptions, and this nails it: If I treat an error as data, I am forced to deal with it. Right now, just where I would process the good result. No handing the exception outward, no wrap-to-catch-later. That way, Exceptions are limited to things that I, as a programmer, have not foreseen, and that's the way they are meant to be used. Idempotence, something she touches on in the very end, is quite important, too. Good to have a word, now. It describes the idea that an executable block of code (so, a function or a Single Abstract Method object) should change the world only once, even if it's called multiple times. From her talk, I picked up the notion that this should be true for every function, and I don't fully agree with that because complexity increases when I build things out of things that build things, even if those are just functions. The third main takeaway was her call for Lazy Evaluation. Doing that forces you to think in Objects or First Order Functions, and prevents procedural style – and that should always be a good thing. I first stumbled when Jessica introduced a service object to limit a function's access to the database. Isn't that an application of the interface segregation principle (ISP) and the Single Responsibility Principle (SRP)? Smalltalk people always told me that even in Java, the client should define the exposed interface, and this is just that: If I need a service that just inserts, the method should have access to only that. Next, she speaks about specific typing - again, isn't that just OO? If something represents a name, I should call it "Name", not "String". The DDD people have said it since 2004 and hardly anyone listened, so Jeff Bay had to point it out again in his paper on Object Calisthenics some seven years ago, calling on us to "wrap all primitives and Strings" (and numeric objects, of course). Applying this principle in classes and productive code, I can well say that it is a game changer - your code becomes much more clear and expressive this way, even more so when you apply his next rule – "use first order collections" - as well. Back to Jessica: Good on her picking up on that, I fully agree. It surprised me, though, that she watered down the principle by us to Options and Tuples later on in her talk. Those two are never domain specific, so effectively, she just put two new primitive types on our plate. More recent languages have more elegant ways of expressing these concepts, and they might feel more at home there. I was surprised once more when she presented the lack of concern about when or how my code is executed as a principle of functional programming. With the OO concept of encapsulation comes the idea of Single Abstract Method objects, which are handed around as executable blocks. She even pointed us to the GoF patterns Command and Strategy, so clearly, this has been around for a while and was considered OO back then. Did the GoF silently sneak in functional ideas? How dare they! Apart from these three good points, there was one I didn't get: Structural Sharing? What was it about, memory efficiency? Didn't she just tell us that we should rely on our compilers instead of doing their work? So, all in all, it doesn't matter. Whether it's OO or functional, this is a good talk to watch. If you want to brush up on intermediate concepts of coding or see some examples of how things might get easier if you break your common patterns: Go watch!